as food, medicine and shelter for those caught up in the crisis. 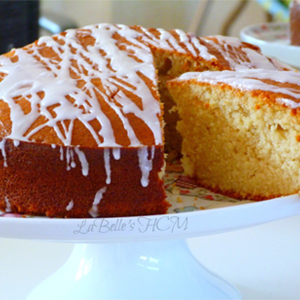 The Nigeria Pound Cake is spiced with nutmeg and satisfyingly dense. It is very popular in Nigeria and is often served on special occasions. 1. Pre-heat the oven to 160°C. Grease a 9in round cake tin, line the base with baking paper and grease the paper. 2. Sift the ﬂour, baking powder and nutmeg, and set aside. 3. Beat the eggs with a whisk in a separate bowl and also set aside. 4. Mix the butter and sugar until light and ﬂuﬀy. 5. Pour the beaten eggs gradually into the butter mixture, alternating with ﬂour and mix well until combined – and add in the vanilla essence. 6. Pour the mixture into your prepared cake tin and bake in a preheated oven for about 1 hour 30 minutes. Do reduce the cooking time, if you split the mixture between two cake tins. 7. To check if the cake is baked, insert a skewer into the centre of the cake. If it comes out clean your cake is ready. 8. Remove from the oven and leave to cool completely in the cake tin. 9. For the icing, mix 3 tablespoons of icing sugar and 2 teaspoons of milk in a bowl until well combined. Drizzle over the cake and serve.